SRINAGAR: Early Wednesday morning, Srinagar woke up to ‘no internet’ and everybody got panicked thinking it might be something related to law and order situation. 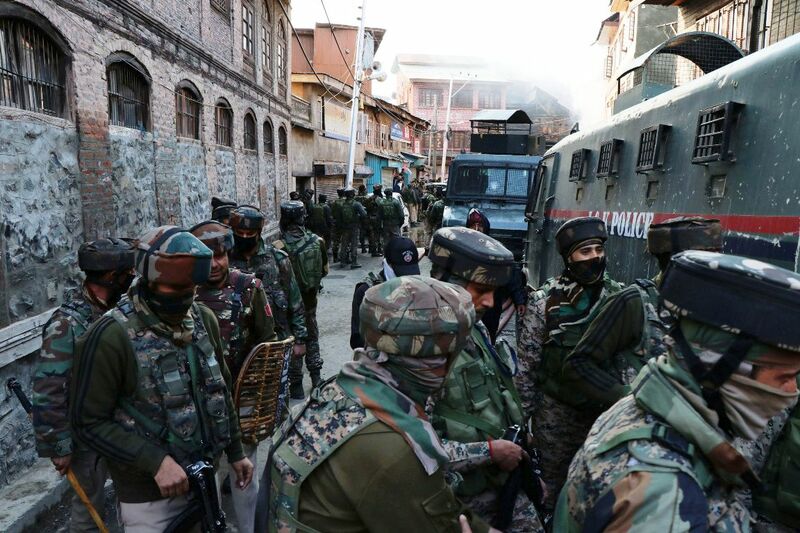 It was a security situation that eventually proved as an encounter that was underway in the old city Fateh Kadal where one civilian-son of the house owner where the encounter took place, two militants and a policeman was killed. The civilian was identified as Rayees Ahmad Hanga. He was the son of the house owner Habibullah, a former professor of the University of Kashmir. It was in one of the two houses where militants were hiding. Slain Rayees was a post-graduate married man and is survived by a six-month-old son, Ibrahim. Incidentally, Habibullah is currently a cancer patient. Slain man’s sister is a teacher and was married a month ago. The family alleged that their son was not involved in any militancy. Rayee’s mother, Shakeela, spoke to reporters saying that at midnight, forces laid a siege and jumped over the main gate of their house and entered inside. “He was crying and asking them not to beat him. At 6 am, we were asked to come out and shifted to another house. In the morning, we came to know that Rayees was killed. I don’t know how he was killed. I can only say that he had no militant links and was running a bakery shop,” she said. As the encounter was going on, authorities in Srinagar ordered for the closure of all the educational institutions to avoid any untoward incident. However, clashes were reported from Islamic University Science and Technology (IUST) and many people have sustained injuries during the clashes. The two militants were identified as Mehraj Bungroo, son of Sona-ullah Bangroo, a resident of Narparistan Fateh Kadal, a top LeT commander who had joined militancy on March 24, 2016, and Fahad Waza, son of Mushtaq Ahmad Waza resident of Akilmir Khanyar, a militant of LeT, who joined militancy on March 23, 2018. The encounter ended at 9.30 am and the house of Habibullah Hanga was fully damaged in the encounter and the four bodies were recovered from the house debris, he said. The officer said that they are still investigating if the killed civilian was somehow associated with the militants. “He was part of the group in providing shelter and logistics to the militants and is being investigated,” the officer said. A senior official said that all the four bodies were later shifted to Police Control Room for medico-legal formalities and later in the evening the three bodies: two militants and one civilian, all residents of Old City, were handed over to their families. 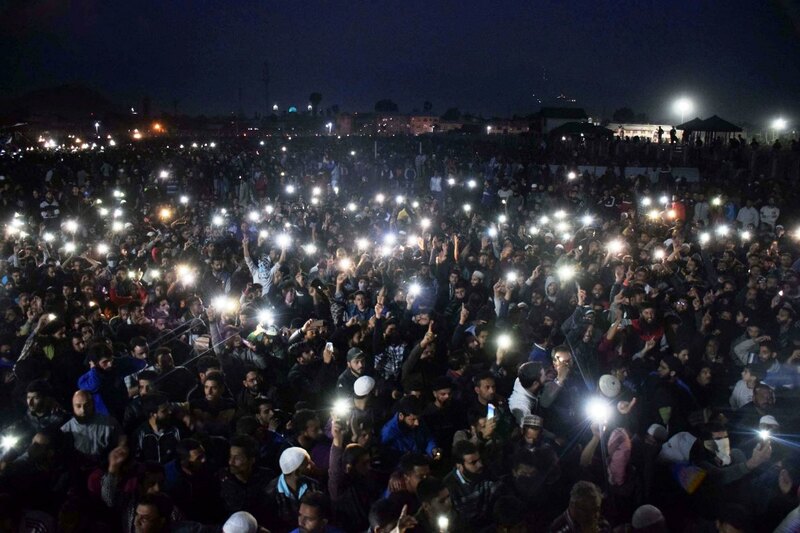 “The funeral prayers were held at their respective places and then all the three bodies were taken to Eid Gah, where second funeral prayer was jointly held for all the three in which around 15,000 people participated,” said a local. 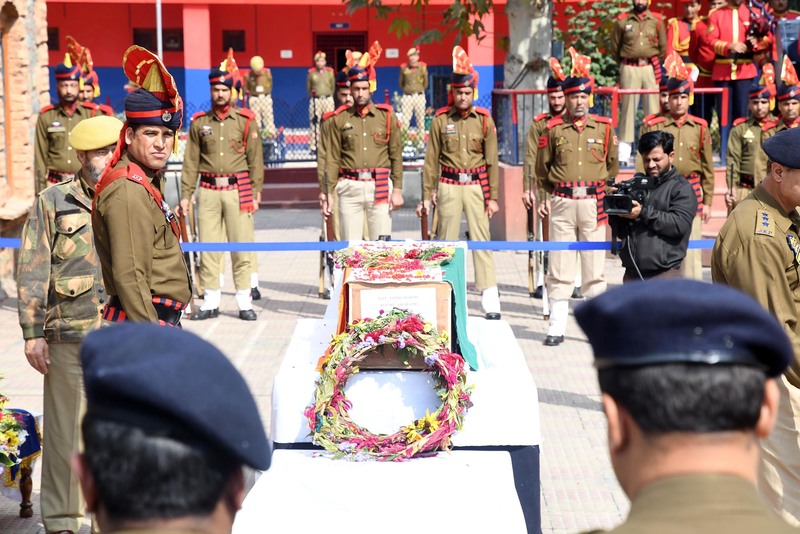 Top police and civilian government officials were part of the wreath laying event of the slain constable Kamal Kishore in the police control room Srinagar. He was a resident of Reasi and State Police Chief Dilbagh Singh termed him a “brave man”. “During cordon and search operation civilians were evacuated. While search operation was going on at the target location, militants made indiscriminate firing from inside. During the encounter, all the two militants and their active accomplice refused to come out of the house and in turn fired upon the search party. Consequently, they were killed in the encounter. The eliminated militants and the active accomplice have been identified as Mehraj-ud-Din Bangroo, Fahad Mushtaq Waza and Rayees Ahmad. Mehraj-ud-Din Bangroo @Asif @Piya son of Sona-ul-Lah Bangroo resident of Narparistan Fateh Kadal had a long history of criminal records pertaining to militancy-related activities. “He was involved in case FIR No 146/2002 U/S 7/25 I. A. Act P/S MR Gunj, FIR No. 32/2007 U/S 307 RPC 7/27 IA Act P/S MR Gunj, FIR No 27/2016 U/S 302 RPC, 7/27 IA Act of PS Zadibal related to killing of two police personnel at Bagh-e-Ali Mardan Khan near Zadibal, FIR No 69/2016 U/S 302, 392 RPC 7/27 IA Act of PS Batamaloo pertaining to killing of one police personnel and snatching of his weapon at Tengpora Batamaloo. Faid Mushtaq Waza son of Mushtaq Ahmad Waza resident of Akilmir Khanyar was also involved in several militant-related incidents. Many cases were registered against him including FIR No. 45/2016 U/S 148, 149, 336, 332, 427 RPC, FIR No. 28/2017 U/S 147, 148, 149, 336, 152, 353 RPC at Police Station Khanyar. The complicity of Rayees Ahmad who was part of the group in providing shelter and logistics to the militants is being investigated. Incriminating materials including arms and ammunition were recovered from the site of encounter. Police have registered a case in this regard and investigation has been initiated. As the encounter was over, the cops attacked camera persons working with different media outlets and left many injured. A Srinagar based photojournalist said that as the encounter was over, they were just clicking the photos of the site and suddenly a group of SOG personnel came and started beating them. “Later a police party joined them and we all were beaten to a pulp,” he said and added that police also resorted to the aerial firing. The incident has resulted in injuries to many photojournalists. “I was beaten by four policemen and the only thing I could do was to save my camera, many of us have sustained injuries,” Vice President Kashmir Photographers Association told Kashmir Life. 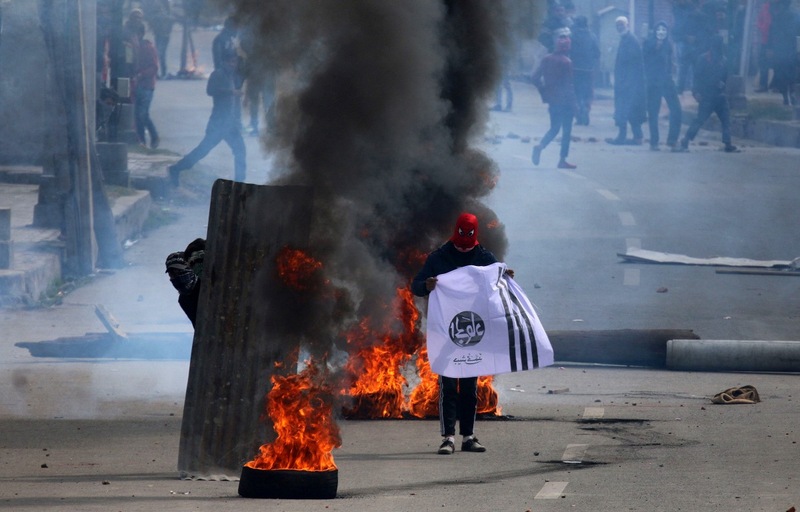 The killing sparked off violent protests in the Old City of Srinagar and led to a spontaneous shutdown. Law enforcing authorities suspended mobile internet services and closed all schools and colleges in Srinagar. Clashes broke out in several parts of uptown Srinagar and old parts of summer capital soon after the gunfight was over, including Karfalli Mohalla, Dukanai Sangeen Fateh Kadal, Malik Angan, Zaaldagar, Akil Mir Khanyar, Sabzi Mandi Soura, Kral Khud Naye Sadaq, Hari Singh High Street, Parimpora, Ali Jan Road, Babdem, Kazgari Masjid Fateh Kadal. The government forces burst tear gas canisters and fired pellets to disperse the stone pelting protesters. At least twenty people were reportedly injured in the clashes that continued till late evening. ps: This story was slightly modified in wake of certain new information that came to the newsroom.